Masnavi is the great masterpiece of Persian Sufi poet, Maolana Jalaluddin Balkhi(Rumi) who lived in the 13th century. The title Masnavi-I Manavi means 'Rhyming Couplets of Profound Spiritual Meaning.' Comprising six books of poems that amount to more than 50,000 lines, Masnavi pursues its way through 424 metaphorical, allegorical, and mystical stories that illustrate Man's predicament in his/her spiritual journey in search of God. make a breach in the island of Masnavi." "The Masnavi is a majestic river, calm and deep, meandering through many a rich and varied landscape to the immeasurable ocean; the Divan is a foaming torrent that heaps and plunges in the ethereal solitudes of the hills.. Rumi is the greatest mystical poet of any age." Professor R.A.Nicholson (the great 20th century British Orientalist and scholar of Rumi who dedicated 35 years of his scholarly life to translating Rumi's Masnavi from Persian/Farsi to English). "When I experienced Rumi's poetry, which is vibrant with the tone of ecstasy and with melody, I realized the deficiencies of Shakespeare, Goethe, and Victor Hugo." The French writer, Maurice Barres. "The sublime humanism of Rumi fired the imagination of mankind long before the West discovered the dignity of man. Dante was a young boy at the time of Rumi's death. The great humanist of the West, Petrarch came a full century after him; and Erasmus followed him two and a half centuries later. Hegel considered Rumi as one of the greatest poets and thinkers in world history.The twentieth century German poet Hans Meinke saw in Rumi 'the only hope for the dark times we are living in. '...In Turkey, Iran, India, Pakistan, and Afghanistan, Rumi is honored as a saint, a sage, and a seer..." Excerpts from Professor Afzal Ikbal, the great Pakistani scholar of Rumi's par excellence book 'The life and work of Jalaludin Rumi'. Professor Ikbal's monumental book is A MUST READ for anyone interested in Rumi's scholarly biography and teachings. "Rumi is thus seen, not just as an icon of Islamic civilization (or of Afghan, Iranian, Tajik or Turkish national heritage), but of global culture. And, indeed, the popular following he enjoys in North America as a symbol of ecumenical spirituality is evident in bookstores, poetry slams, church sermons and on the internet.."
Professor Franklin Lewis on Rumi's influence in our beloved America. "The universal message of Rumi is a hopeful alternative to the ignorance and lack of spirituality in modern times. 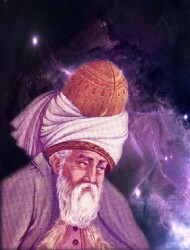 Rumi's writings of the thirteenth century advocate an understanding that there is something beyond religion and scholarly learning that can open our eyes to the reality beyond this existence; for Rumi we must climb a spiritual ladder of love. Furthermore, Rumi envisioned a universal faith, embodying all religions, because he understood that the cause of every religious conflict is ignorance. Rumi implies that religiosity consists in something other than outward religions. Real belief is apparent only on the inside of a person, which is not visible. Therefore, Rumi makes it clear that the religion of love involves loving the eternal and invisible source of existence.."
Excerpts from Rumi and the Universality of his Message, by Muhammad Este'Lam. “Rumi’s message transcends the limitation of language and the boundaries of time. Human beings were born for unlimited freedom and infinite bliss, and their birthright is within their grasp. But in order to reach it, they must surrender to love. What makes Rumi’s expression of this message different from other expressions is his extraordinary directness and uncanny ability to employ images drawn from everyday life. I must admit that I have been a bit unsure of where to begin. Many of you are dedicated disciples of Maulana Rumi. Others have just participated in a panel discussion on the significance of his poetry led by leading academics. For such scholars to be followed by a mere student of Rumi is a tall task, even for a Secretary-General! Of course, just by looking around this hall, I can claim confidently that, eight centuries after his birth, Maulana Rumi lives on. This event is a wonderful opportunity to reaffirm our devotion to his humanist philosophy, and to highlight the principles of tolerance, understanding and compassion which suffused his compositions. As Secretary-General of the United Nations, I hope to carry out my duties cheerfully and with humility just as our moderator suggested. I know this is a tall task but I would like to accomplish it with the same tolerance, understanding and compassion that the Maulana teaches.